There's a petition to bring back 3D TVs | What Hi-Fi? The petition's creator wants to be able to watch his 3D Blu-rays on, ideally, a shiny new OLED TV. There's no stopping progress. But not all innovations are necessarily welcome. Take LG's decision at CES to drop 3D from its OLED and LED TVs. You might think it a wise move - after all, most major broadcasters have stopped supporting 3D, and 3D films have all but died a death. But plenty, it seems, think differently. One man, Aidan Padden, has decided to do something about it. Padden has started a petition to revive 3D TVs for 2018, specifically a 2018 LG OLED TV. 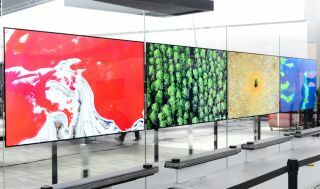 He suggests that as LG Display makes screens for other manufacturers' TVs, the decision to drop 3D from LG TVs has had a knock-on effect on other brands. In truth, we think most TV brands have seen little desire for 3D technology from consumers which, coupled with a reduction in the amount of 3D content available, means it's an easy feature to drop. "They've added 3D sound with [Dolby] Atmos but removed 3D vision - you'd have thought they'd have worked well together," he writes. He goes on to say that without 3D, he and many others like him won't be able to enjoy their 3D Blu-ray collections in all their glory. A fair point for anyone who enjoyed the 3D experience. "There are hundreds (if not thousands) of us across the world who have paid literally thousands of dollars/pounds/euros for these discs which we paid a premium for over 2D Blu-ray [who] do not want to lose access to these when our 2016 OLEDs bite the dust." The petition has so far notched up 2,570 supporters, so he's not entirely alone. That said, we fear a 3D revival is likely to be a long shot. And certainly there was no mention of 3D among the flagship 2017 TVs announced last week at CES. What do you think? Would you like to see 3D make a comeback? Let us know in the comments below.